Luxury Goods Market is expected to garner $429,762 Million by 2022, growing at a prominent CAGR of 3.9% from 2016 to 2022. Luxury goods are high-value products in terms of price and quality. These goods are mostly considered as status symbols for individuals. The global luxury goods market has significantly benefited from the economic growth in the Asia-Pacific and LAMEA regions. Increase in spending capacity of consumers and rise in living standards are expected to boost the market growth. Countries in the developing regions, such as China, India, South Korea, UAE, and Brazil exhibit promising opportunities for luxury goods manufacturers. Increase in GDP along with growth in sales of luxury brands have boosted the market growth. The luxury goods industry has witnessed an upsurge in their demand in the recent years, owing to inclination of consumers towards luxury goods and increased preference for premium products over cost-effective products. Advancements in online marketing and increase in use of digital media for product marketing are the key factors contributing to the growth of the global luxury goods industry. Increase in adoption of technologically advanced and high-tech products would contribute to the growth of e-commerce websites for luxury goods. However, uncertain economic situations are some of the major factors that could hamper the market growth. The 2007-2009 economic slowdown had a negative effect on the sales of luxury goods, globally. Currency fluctuations and less number of brand outlets in developing regions could be the market restraining factors. The market is segmented based on product type, gender, mode of sale and geography. The overall luxury goods market size is the summation of the revenues generated from luxury products, such as designer apparels & footwear, cosmetics, travel goods, fine wines/champagne, jewelry & time pieces and other luxury goods. The designer apparels & footwear segment has a major share in this market, followed by jewelry & time pieces. However, accessories and other luxury goods segment is likely to grow at a fast pace, especially in emerging markets, throughout the forecast period. The manufacturers are focusing on craftsmanship and quality of the product, owing to which the market would witness a surge in the demand for all product segments. The key players profiled in the report include The Estee Lauder Companies Inc., LOral International, LVMH Group, Kering SA, The Shiseido Company, Ltd., Prada S.p.A., Ralph Lauren Corporation, Swatch Group, Luxottica Group S.p.A, and Compagnie Financire Richemont SA. LVMH Mot Hennessy-Louis Vuitton SA holds the highest luxury goods market share among others. 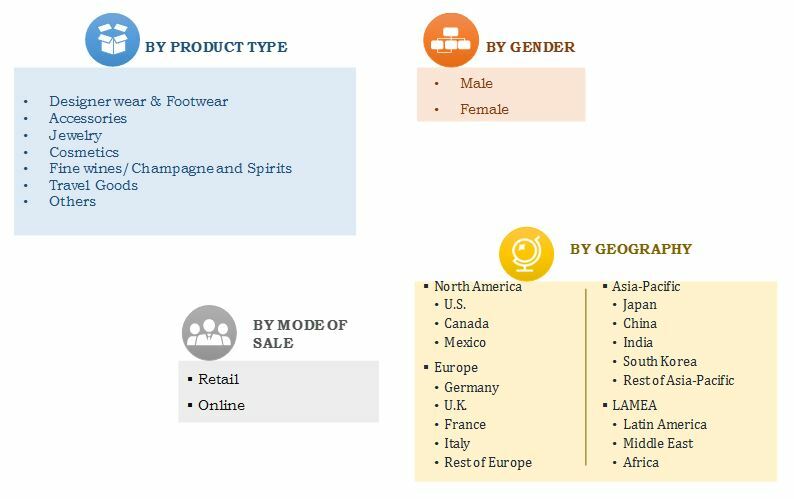 Based on product type, the global luxury goods market is segmented into designer apparels & footwear, accessories, cosmetics, jewelry, travel goods, fine wines/champagne & spirits, and others. The demand for designer wears is high due to frequent changes/ modifications in fashion trend. Fashion trend majorly rely on culture. Due to difference in cultures between consumers in developing economies from those in developed economies, fashion designers are facing challenges in modifying their designs so as to cater the demands of the customers. The designer wear & footwear segment dominates the market with 38.8% market share in 2015. The others segment, which includes writing instruments and electronic gadgets would be the fastest growing segment, with a CAGR of 6.0%, owing to technological advancements and hence, the high demand for hi-tech products. Disposable income of an individual is a top impacting factor for the luxury goods industry. It allows the consumer to spend more on luxury items and on enhancing lifestyle along with scope of investment leading to increased sales of leather accessories and travel goods. The demand for luxury goods is projected to continue to increase the adoption throughout the analysis period, considering further rise in disposable income. Increase in urban population is one of the impacting factors for the luxury products market. Urban culture influences the individuals living style. Presently, more than one-fourth of the world population lives in rural areas. As per data released by United Nations, about 54% of the worlds population lived in urban areas in 2014, and it is expected that more population will shift in urban areas during the forecast period. The impact of this factor is anticipated to increase during the forecast period, consequentially fueling the demand for luxury goods. The standard of living among people is increasing, owing to higher disposable incomes, improvement in lifestyle, and increase in corporate culture. Increased proliferation of corporate entities in developing nations has popularized the carrying expensive & luxurious products culture among consumers. Based on the analysis and prevailing trend, consumers in developing countries are expected to gradually gain understanding of personal appearance. In addition, the impact of this driver is anticipated to continue during the forecast period. 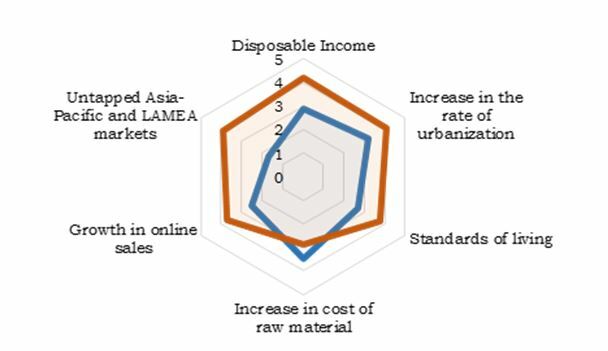 Raw materials play a vital role in luxury goods industry, and its cost increased significantly in the past few years. Leather is the major raw material preferred for luxury handbags and accessories manufacturing due to high demand for the same. However, foreseeing the advancement in manufacturing technology, wood, soft synthetic, and other materials can be used to manufacture stylish and high aesthetic value goods. This is expected to lead to a shift from leather goods to other materials that can be procured at comparatively lower price, consequently lowering the impact of cost factor and creating favorable environment for the market. Online sales is the new trend in the global luxury goods industry. Increase in the number of online portals as well as their rising popularity fueled the market growth. Growth in the number of working professionals and busy lifestyle supplemented with technological awareness are the key factors responsible for boosting online sales. In addition, online sales offer direct-to-home delivery service, which is one of the key driving factors among urban as well as semi-urban consumers. Online sales trend was limited to developed nations, but has recently gained prominence in the developing nations. Asia-Pacific and LAMEA are the two important regions that hold immense growth potential for this market. Technological advancements and growth in awareness among consumers are the key factors that encourage consumers to shift from normal goods to luxury products. The continuous improvement in standards of living in these regions has posed lucrative opportunities for market players to expand their foothold in the Asia-Pacific and LAMEA regions during the forecast period. 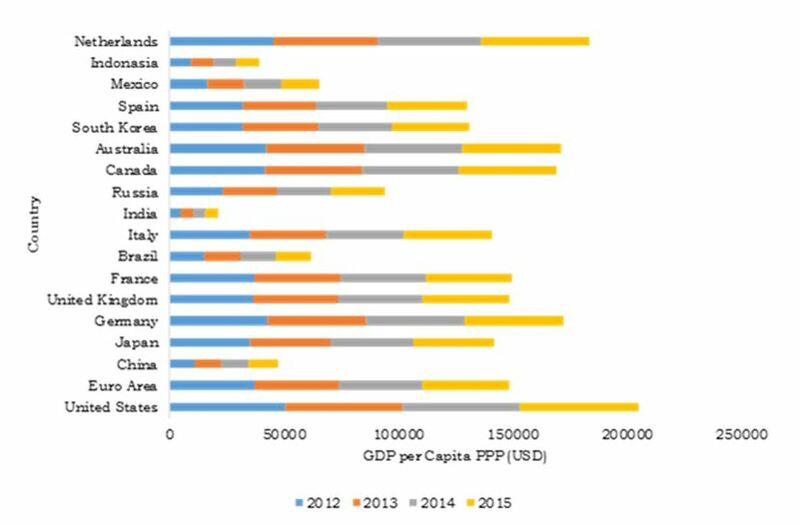 The GDP per Capita Purchase Power Parity (PPP), as given in the below figure, shows an increasing luxury goods market trends in major countries of the world such as U.S., the Netherlands, Canada, Japan, and others. On account of increased purchasing power, people are able to afford the luxury products. The study provides an in-depth analysis of the global luxury goods market, with current trends and future estimations to elucidate on the imminent investment pockets. The report provides a detailed impact analysis and information on luxury goods market trends, restraints, and opportunities. Porters Five Forces Model illustrates market scenario by analyzing various parameters such as threat of new entrants, threat of substitutes, strength of the buyers, and strength of the suppliers operating in the market. The quantitative analysis of the luxury goods market size from 20142022 is provided to elaborate the market potential. 8.10. THE ESTEE LAUDER COMPANIES INC. There is a rapid growth in the luxury goods industry owing to the luxury goods market trends such as increasing urbanization, the vitality of high-end marketing channels, and the swift rise of the middle class in the developing markets such as in Asia-Pacific. In addition, innovation in wearables, increased exposure to social media, and demand for hi-tech luxury goods have fueled this market. However, price differences, geo-political instability, and fluctuation in currencies could hamper the market growth. Increased tourism in Asia-Pacific and Europe has contributed to the sales of luxury goods. Moreover, growth in demand for designer apparels, jewelry, watches, and exquisite beauty products such as makeup and perfumes drive this market owing to the increase in beauty consciousness and purchasing power of consumers. In addition, attractive packaging, innovative marketing strategies, and product launch boost market growth. For instance, in June 2016, Shiseido Company Limited launched new series “Fearless Beauty” that has further strengthened the makeup product line of the company. The global luxury goods industry has witnessed prominent adoption in developed regions owing to swift change in consumer lifestyle and increase in disposable income. Europe generated the maximum revenue and is expected to lead throughout the forecast period. However, Asia-Pacific countries such as India, China, and Japan are the most lucrative market for luxury good companies as they have indicated an increase in beauty consciousness and rise in disposable income. The key market players have developed high-quality and innovative products to cater the changing consumer needs and lifestyle. Moreover, they are shifting to online portals as it is a popular medium to buy luxury products.